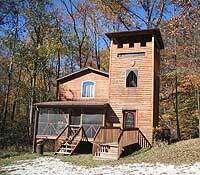 A "Castle of Love" and the ultimate in charm and spaciousness, complete with lookout tower! Large outdoor wood deck with patio furniture is out back secluded among White Oak giants. Sleeps up to six and features two bedrooms, fireplace, flat screen TV (local channels), and jacuzzi. Also enjoy the private, 6-person, outdoor hot tub overlooking the forest!